"Portrait of Olympic Founder Pierre du Courbertin"
In April 1886, the Olympic Games were resurrected and played in Athens, Greece. Thanks go to founder of the Modern Olympic Games, Pierre du Coubertin. One hundred years later, at the Centennial Olympic Games in Atlanta, Georgia, a statue honoring Coubertin was erected in Centennial Olympic Park. 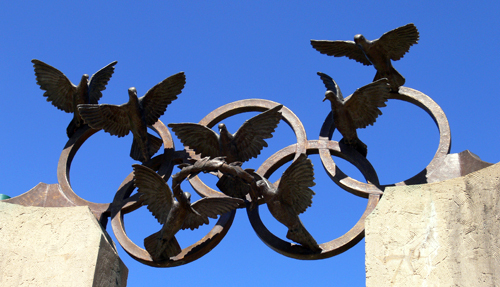 Atop the monument are seven doves carrying the Olympic Rings and a laurel wreath (photo). Portrait of Olympic Founder Pierre du Courbertin was created by sculptor Raymond Kaskey. Among Kaskey's creations are the bronze-work for the National World War II Memorial in Washington, D.C. and Portlandia in Portland situated outside the Michael Graves' Portland Building.